There are plenty of casting jetties on River Kymijoki. River Kymijoki is the southernmost salmon river in Finland, flowing into the Eastern Gulf of Finland at the City of Kotka. In terms of fishing, the most interesting sites include the lowest five kilometres on the eastern branch of the river. 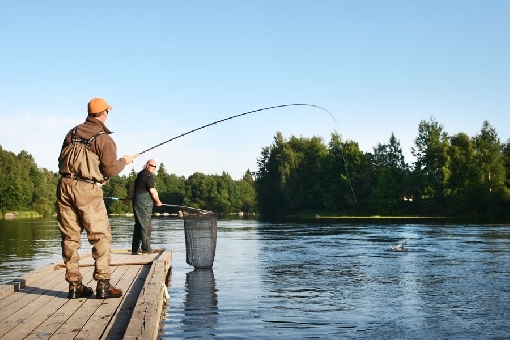 On River Kymijoki, anglers fish in an urban environment while still being able to enjoy peaceful nature. The average weight of salmon caught on River Kymijoki has been around 6 kilos in recent years and anglers also catch over 15-kilo specimens every year. However, it’s been more than 100 years since the record salmon – weighing over 35 kilos – was caught. 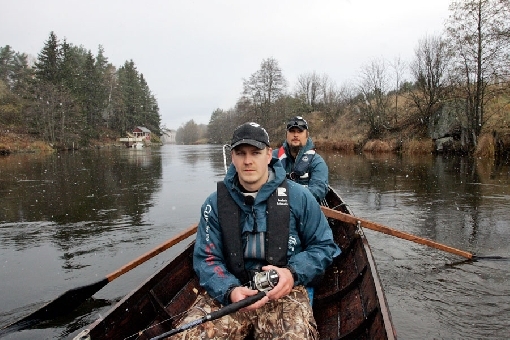 In the best years, the fishing season on River Kymijoki lasts almost through the year and it is possible to fish sea trout on rowing boats in the trolling areas throughout milder winters. 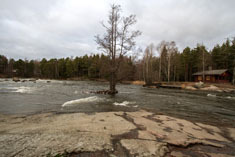 You can also fish on the Siikakoski Rapids using a fly rod when waters are high. 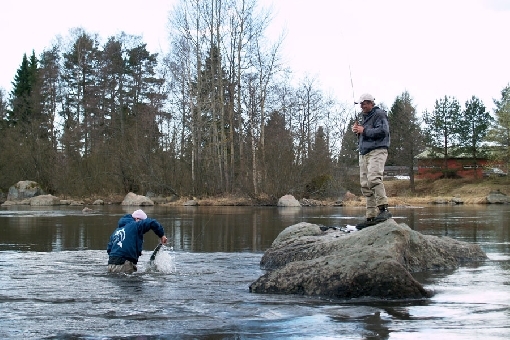 The annual cycle on River Kymijoki begins in April when sea trout start swimming up the river. This migration period continues through to June, when salmon take their turn. 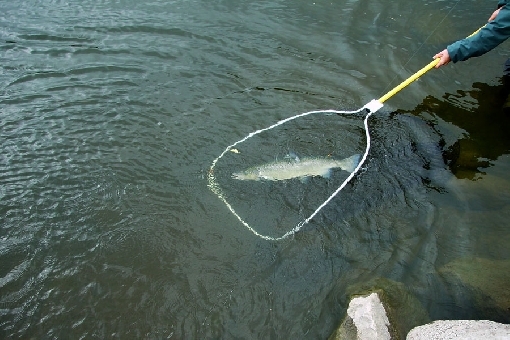 The river is stocked with rainbow trout in early May before the salmon arrive. The salmon season starts in late June and continues through to the turn of August and September. There is no autumn closed season on the Korkeakoski branch, where October and November provide an excellent trout season. 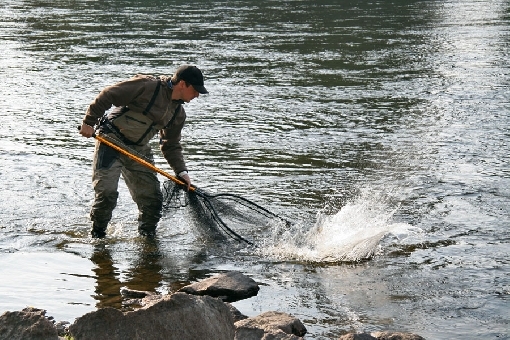 Salmon are pursued on River Kymijoki using spoons, plugs and tube flies. Red-and-blue and bright colours are popular. 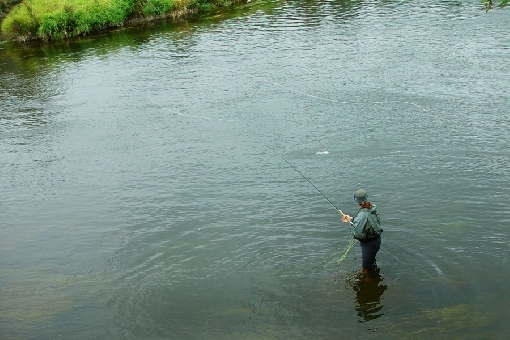 Many anglers cast flies using the local ‘spinfluga’ style, i.e. casting flies with heavy weights. The best season for asp runs from May to August. As the waters warm up, these fish that weigh many kilos gain in strength, almost matching salmon, so anglers expecting to hook salmon may enjoy the excitement of fighting these big cyprinids. In autumn, big whitefish rise into the river. Just add a weight to the end of your line and a worm to a couple of hooks on side leaders, and you may well be able to catch a whopper weighing over a kilo. 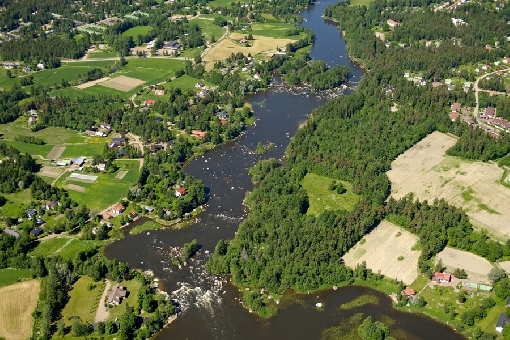 Sizeable salmon migrate into River Kymijoki. 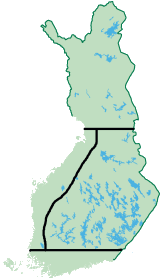 In its lower reaches, the eastern main branch splits into two sub-branches, Langinkoski and Korkeakoski. 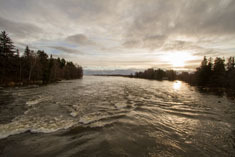 The most significant fishing grounds in the Langinkoski branch are Langinkoski, Siikakoski, Ruhavuolle and Koivukoski, listed in order starting from downstream. On the bank of the Langinkoski Rapids sits the imperial fishing lodge used by the last Tsars of Russia on their fishing trips, still in its original shape. The Langinkoski Rapids is exclusively reserved for fly-fishers and it is considered as being the best sea trout rapids in Southern Finland. The Ruhavuolle area is a popular fly-fishing site; this is a stretch of deep and fast-flowing torrent that yields large quantities of big fish every year. The Siikakoski Rapids and the downstream Kokonkoski Rapids are key fishing grounds in the river and great sea trout spots in particular. There are also peaceful stretches of rapids where there are less people fighting for space. 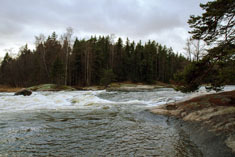 The uppermost rapids in the Langinkoski branch are the Koivukoski Rapids, where you can only fish with a guide. The other sub-branch of the river is a couple of kilometres long stretch leading to the Korkeakoski Rapids. The most popular fishing site in the entire river is probably the Korkeakoski casting jetty just below the power plant. Here you can seldom go fishing alone, but on the plus side, the area also offers among the best odds of catching something. 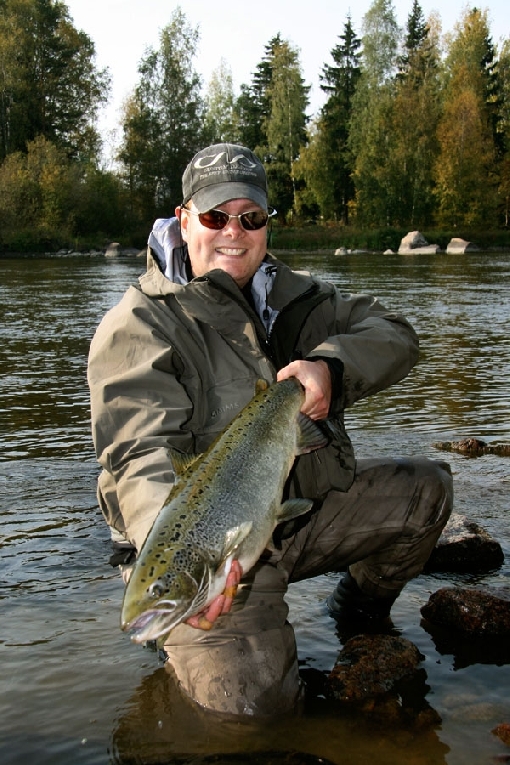 There are excellent hot spots in the trolling area in the middle section of the Korkeakoski branch, which yields several whopper salmon and handsome sea trout every year. The mid-stretch of River Kymijoki flows along in the midst of forests. 30 km from the river mouth, downstream from the edge of the town of Anjalankoski, starts the Keski-Kymi special fishing area, where some salmon and sea trout find their way. This 17 km stretch between the Koskenalusjärvi reservoir and the Ahvionkoski Rapids has great spots for fishing pike, zander, asp and rainbow trout. In addition to spinning and traditional trolling on a rowing boat, you can also go motor trolling in this area. The Siikakoski Rapids is rocky and well-stocked. River Kymijoki represents the lush and verdant fluvial nature of Southern Finland. The river meanders through fields and forests. The water is slightly muddy, but water quality is good. The power plants regulate the water level. Amenities available for anglers on the riverside are good, including casting jetties, campfire sites and restaurant services. During the peak salmon season, you should be prepared for the high numbers of anglers in the most popular fishing grounds. At Langinkoski you can fish for salmonids just like the Emperor Alexander III of Russia used to do! Tucked in the city centre of Kotka, the Langinkoski branch of the Kymi River runs into the sea. The Langinkoski is an approximately 400 metre-long stretch of versatile rapids where fishing is only allowed using fly fishing equipment. 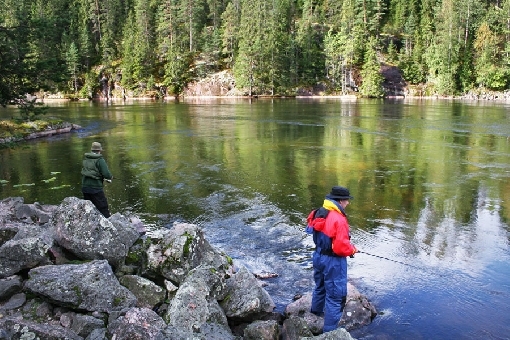 Langinkoski is especially known for its sea trout. 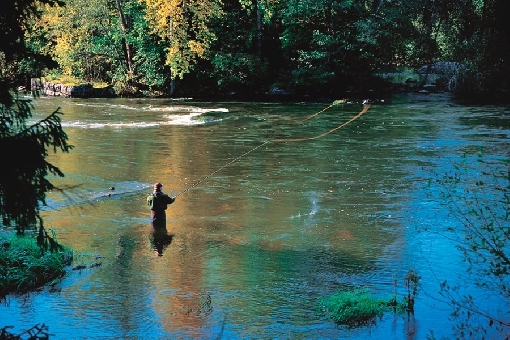 The rapids also give up salmon, but sea trout is the species that most fly fishers are after. Large whitefish also make their way up the river in the autumn. The spring season starts at the end of March and lasts until the beginning of May. Many anglers prefer the time after the ice has gone. The autumn season begins in mid-August and lasts until the end of September. The neck of Langinkoski is an interesting and quite slowly running current. The banks there are partly comprised of flat rock. Behind large rocks there are several deeper holes where one might find a lot of fish. You would do well to pay special attention to the swirls of the neck especially in the autumn. In the middle part, by the Imperial Fishing Lodge, the rapids are throttled into a narrow and fierce current. Especially during warm water season you should thoroughly go through both edges of the froths. After the fast-flowing section the rapids ease back into a wider stream where there are plenty of worthwhile back eddies on both sides of the river. A fly fisher should come equipped with waders. There are many spots along the rapids that allow you to wade into the river, except during days when the river is flooding. A two-handed fly rod is recommended. The Langinkoski Rapids are deep and fast-flowing in many places, which means that the use of sinking or sinking tip fly line is advised. There are several parking areas by the rapids. The parking spaces are especially plentiful on top of the hill on the side of the Imperial Fishing Lodge.